Our half-mile jewel of a downtown is the heartbeat of our city. I’ll advocate to allow new events like food trucks, support icons like the library and farmers market, and push for common-sense parking laws and better walkability to make the downtown more vibrant. Every now and again, there’s talk among city leadership of moving the Farmington Community Library out of downtown to redevelop the space on Liberty Street. It’s been a hot topic at several of the more recent library board appointment interviews, with pointed questions being asked. I’m here to say—not on my watch! I worked at the library as a teenager, and I’ve seen firsthand how many people use it, not only for books and DVDs but for the programs, computers, and meeting space it provides. Taking that out of downtown would be a huge blow to our community. I’ll stand for keeping it where it is so we can continue to access its services as a true neighborhood resource. As market manager Walt Gajewski often writes in his Observer column, the Farmington Farmers & Artisans Market perfectly sums up “Saturday life in a small town.” It’s a place to meet your neighbors and friends and support local merchants. 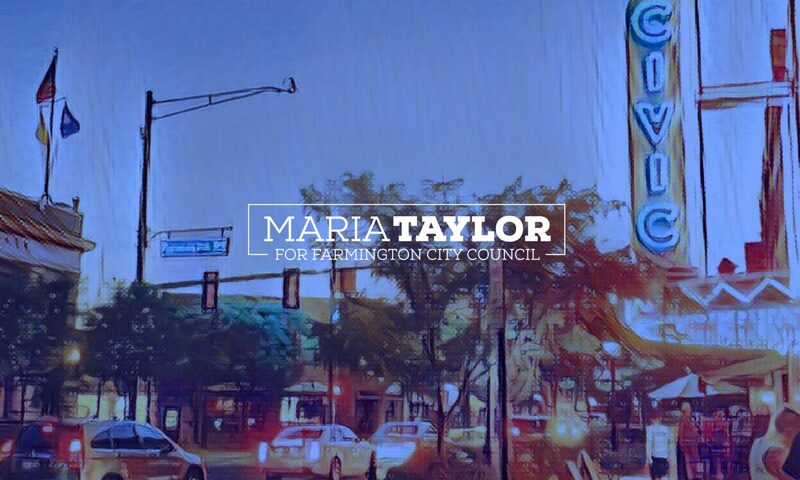 It’s right in the heart of this downtown, and at the heart of this community—a focal point for everything Farmington’s doing right. Back in 2016, word got around that the market might be moved out of the pavilion to a parking lot. Rumor or not, some 200 people packed the city council chambers to speak for their love of the market and its location at the pavilion… then had to listen while one councilman publicly apologized for our citizens’ love of the downtown icon. Since then, the market has been allowed to stay at the pavilion. But at the end of the meeting, when someone asked for a long-term commitment to keep the market as-is, that commitment was only for one season. I’ll give you my word that when I’m elected, my vote will be to keep it there for as long as the community desires. We Farmington people love to walk in the community. It’s part of the city’s appeal for families and seniors and young people alike. But is it really walkable when just this spring, a child got hit crossing Grand River in broad daylight? Or when the crosswalk sign by CVS is routinely flattened by traffic that just won’t slow down? It’s true—Grand River is a busy Metro Detroit road. That can’t be avoided. At the same time, people’s well-being—maybe even their lives—are what’s at stake. As your representative, I’ll put people first. I’ll push to make our streets and crosswalks and sidewalks safer, be it through adding stop signs in neighborhoods and ramping up signage and enforcement downtown. Or maybe it takes something more creative. Something that’ll make drivers take a second look instead of roaring by. All it would require would be some paint and someone to do the work. And since we’ve already got plans in place for adding some murals and public art to the downtown, why not add some walkable art as well? I think it would be a great fit and a lot of fun. And it just might help slow the cars, too. I’d love to start moving the focus of our downtown streets from cars to pedestrians. Right now, we’ve got a committee on parking. What about a committee on walkability? A group of citizens from all across the neighborhood who like to walk and could give input on how to make our streets more pedestrian-friendly? Count me in.